pristine and cool crater lakes, sacred caves, and lush tropical forests full of exotic wildlife. 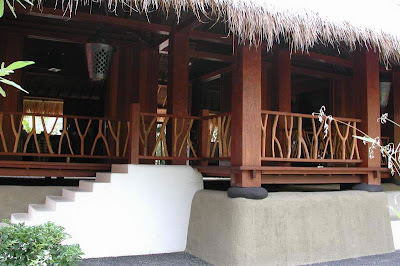 I Love Balinese architecture...Often sacred and rife with meaning. organic statements in complete harmony with the environment. 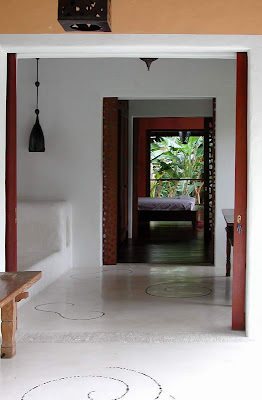 There is a building principle of Kosala-kosali where local architects determine the optimal placement and position for certain rooms of the building. 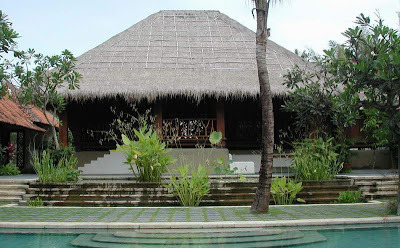 the first place the local witch doctor will look for is any unsuspecting violations of the Balinese laws of building. 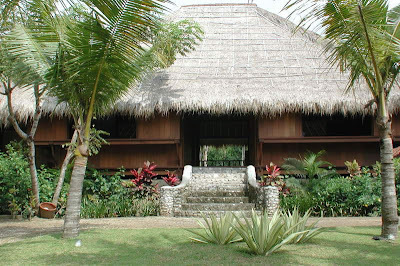 Often homes mimic and blend in with their beautiful surroundings. Head back to Julia's and Fifi's to find more Friday link love! 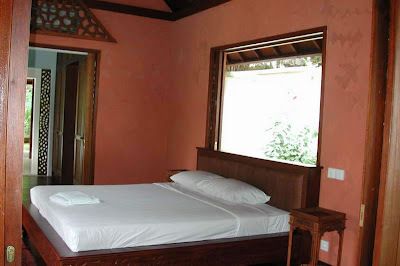 That picture with the coconut wood panels behind the bed is to die for! Isn't it Mango Gal?! 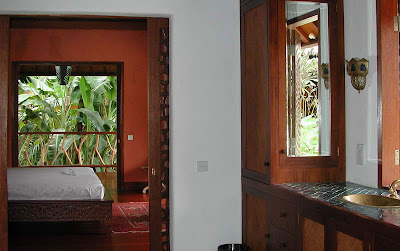 Those panels are the sliding shutters...you can see them open (different room same kind of window)in the picture above it. Yes, yes, yes. I do so want to go to Bali!! I can almost feel the breezes in my hair right now! Oh, thank you....that made me feel all light and airy! i could use a week, or a lifetime there ! I want to move in there and stay forever. 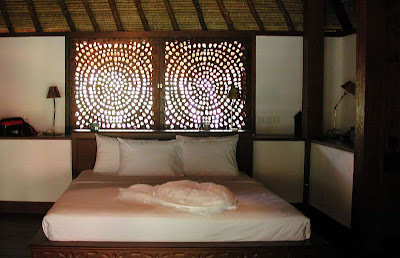 Loving the carved coconut wood panels.. beautiful images! I am breathing easier now! this looks like my nirvana! i love, love, love it! Thanks for the trip. I'm always up for a destination that has a beach. The pebbles in the floor was my favorite element. What beautiful pictures! I especially love the minimal use of color. Basic earth tones and rich wood - that's what makes it so warm and inviting. I love it! glassless window? 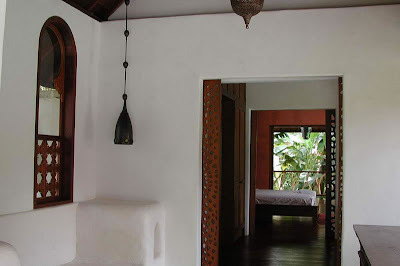 and the coconut wood panels, wow!! I inadvertently deleted my last comment..sorry! Really beautiful,love the Bali style. I found a store in Honolulu that imports coconut furniture, room dividers, shelving from Samoa. Not only beautiful wood, but very artsy style, European looking. Ok, I'm in LOVE! I just took a mini vacation while reading your blog. Thanks! Wow. What I would give to be there right now (rather than here with more snow)! I am SO there, when do we leave? Everything, and I do mean EVERYTHING, looks perfect. Love it all....have never been, but want to go soon.....I have a friend who maintains that the cost of senior care is so high that we should sell everything and just book end-to-end cruises for the rest of our lives....I'm doing the math. What a great vibe I received! Ah, that kind of living would be amazing! What's not to love when it comes to Bali! Thanks for the beautiful post Linda! 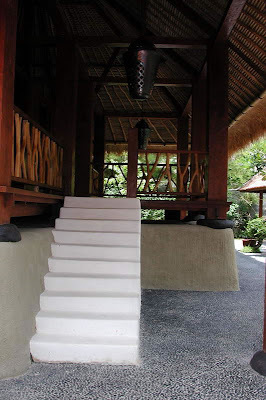 Looks like the perfect meditation retreat! Bali bliss indeed! one day one day...in the meantime thank goodness we have YOU! Do places this awesome exist?! Love the pictures. Another GREAT post... and NOW another desire to run away to the islands... sigh! Thanks for playing along... looking forward to having you in Paris... no pressure... ENJOY! I could never live in that house. I would eat the roof. Sugar AND fiber all in one food? Why has someone not thought of this sooner? Now THAT'S what we think of when we hear "open floor plan"! 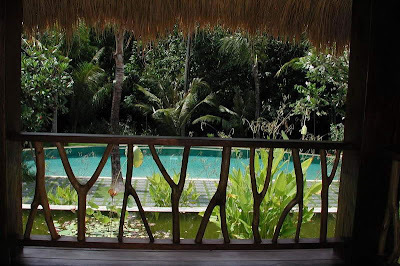 I could totally lose myself in Bali! How wonderful!! Thanks for dropping by DesignTies and commenting on my Natural Stone post... glad to hear that you're still loving your granite! Thank you so much for your kind words regarding yesterday's tragic events. That happened just 10 min. away from where we live. I was glued to the live coverage for a couple hours. It was such a tragic day for my home town and all over the country. Thanks for the paint color suggestions. I realize I didn't make it very clear regarding the company doing our siding. The company is Alside and after looking at the colors they offer (Not many let me tell ya) I called them. I asked pretty much those questions about getting the color I want and it's a no go. Then I asked if they would be introducing a light yellow, No was the reply. So I'm now accepting the cream and slowly accepting it as our color. As soon as we get the samples I should know where to go from here. It's pretty much a dead end. As far as the red door goes. You're absolutely right and I'll do it myself if I have to. I'm really trying not to let this upset me. LOL! Thanks again Linda, you're such a sweetheart. Bliss is right! At first glance at your sugar palm fibers, I thought it said sugar plum faeries! LOL! Beautiful pics! My sister went to Bali for her honeymoon...she said it was heaven on earth, and these pictures support that statement! Ahhhh Linda ~ I can always count on you to "Take Me Away" when I need it the most!